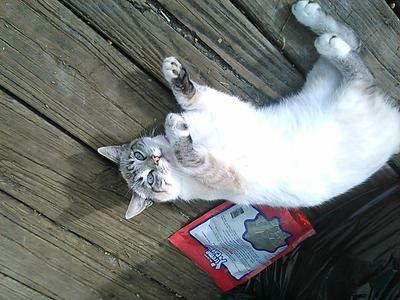 Snowbelle, Miah and Cookie are my cats' names. I was told they are Siamese but never knew what kind. 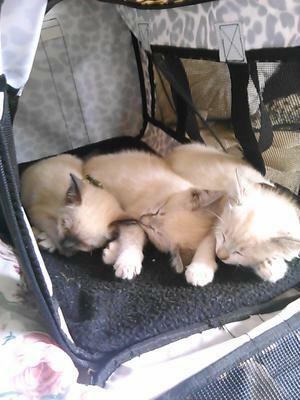 In the carrier from right to left is Snowbelle, Miah in the middle and Cookie is the one with the darker nose - the first night I got them. My friend said she was getting a Siamese cat, and I'd never had one but always wanted one. So I was talking to her over Facebook and the woman she got hers from said that my friend is getting a blue point, and that's when I asked if they had any more. Happily she had more ready to go in a week, and told me she had to get them homes 'cause she couldn't keep them any more so I told her I'll come out and see which one I like. I was so excited and couldn't wait - that week felt like an eternity. 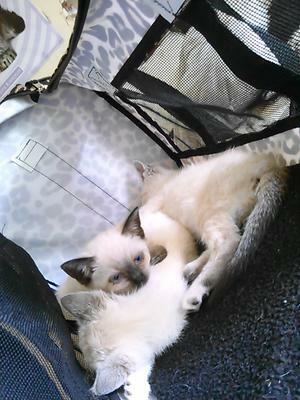 I fell for Snowbelle and Cookie first, so I stuck them in the carrier then my mom put one in the carrier as well! That one was Miah and I asked her what she was doing. She said "look at that, Miah wants to come too". I looked at her and said "really, you already named her?" She said yeah but she claims she never put her in the carrier - she jumped in by herself, but we ended up keeping her. I was told only two boys, and ended up getting three girls 'cause of my mom. Snowbelle and Miah's colors changed as they got older. Cookie sadly passed - she wasn't acting right but I never had a Siamese before so didn't know. Miah and Snowbelle are not loud and voicy like I've heard they are, but rather quiet and mischievous. When they play it's not normal playing, they claw and bite till the point when they start getting mad and chase each other. Snowbelle is the bigger of two and likes to bully Miah and get her on the ground and attack her and then she will just stop and sit there and stare at Miah until she looks away then she pounces over and over and repeats. They get pretty violent with each other. They sure don't like attention unless they want it, they also use your legs as a jungle gym they will climb all over you and fight each other. Thanks so much for the story about your kittens, Kayle, and I'm glad Snowbelle and Miah are growing up well. To discourage them from using your legs as a jungle gym and climbing frame, get a clean spray bottle filled with water and give them a short, quick squirt. Most cats don't like being sprayed with water, and will soon learn that whatever they were doing is unacceptable behavior. You could also use this to discourage them from fighting. In kittens a certain amount of play-fighting is normal while they're establishing their 'pecking order' but you don't want it to get to the point where they're hurting each other. Training them early will pay off as they get older! How sad about Cookie but from the photos it looks as if she was the smallest of the three - perhaps she was never in very good health. 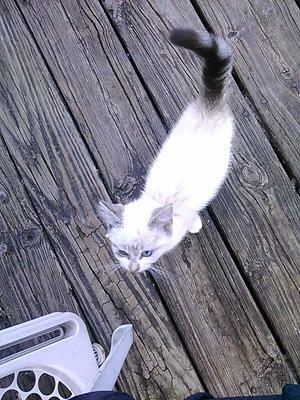 I hope Snowbelle and Miah grow up into healthy and happy cats and enjoy their lives with you!